Throughout the years and market conditions, we have listened closely to our clients and focused on how best to meet their needs. We invested heavily in providing our team with education and tools to aid in our success. And, we explored innovative marketing programs and strategies to help our clients get homes sold quickly. That vision has since become a reality. 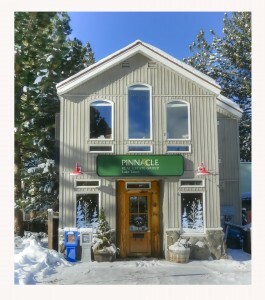 Today, the Souers team along with the Pinnacle Real Estate Group of Lake Tahoe is among the leaders in Lake Tahoe homes sold per agent, production levels and less time on the market. It only takes one buyer to put together a successful transaction yet it can take a multitude of exposure avenues in which to find that buyer. One of the greatest competitive advantages we provide to our clients is our affiliation with the “Leading Real Estate Companies of the World” network. Inclusion into standard real estate franchises simply involves buying in. Admittance into the Leading Real Estate Companies of the World can only be earned. Leading Real Estate Companies of the World has over 130,000 agents worldwide. Through this affiliation, our listings are marketed across 7 continents and over 70 countries. 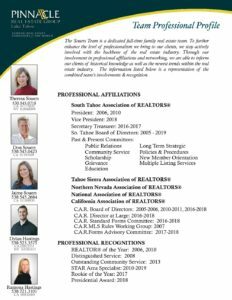 Whether you are buying, selling, or investing in real estate, you can be sure that a Pinnacle Real Estate professional is standing by and ready to assist you.